Every Winter, the human population hibernates. During those bitterly cold four months, the nation is a snow-draped landscape of desolate loneliness, devoid of human activity. Your name is Charlie Worthing and it's your first season with the Winter Consuls, the committed but mildly unhinged group of misfits who are responsible for ensuring the hibernatory safe passage of the sleeping masses. You are investigating an outbreak of viral dreams which you dismiss as nonsense; nothing more than a quirky artefact born of the sleeping mind. When the dreams start to kill people, it's unsettling. When you get the dreams too, it's weird. When they start to come true, you begin to doubt your sanity. But teasing truth from the Winter is never easy: You have to avoid the Villains and their penchant for murder, kidnapping and stamp collecting; ensure you aren't eaten by Nightwalkers, whose thirst for human flesh can only be satisfied by comfort food; and sidestep the increasingly less-than-mythical WinterVolk. But so long as you remember to wrap up warmly, you'll be fine. Jasper Fforde gave up his career in the fim industry when his novel The Eyre Affair debuted on the New York Times bestseller list in 2002. He is the author of the Thursday Next series, the Nursery Crimes series, and Shades of Grey. He lives and works in Wales. "Early Riser has all of the elements and sensibility that have earned Fforde a sizable and devoted following. . . . Fforde writes witty, chewy sentences, full of morsels, and delivers them deadpan. . . . [Fforde's] relentless imagination and his affection for his characters are contagious and irresistible. . . . Every book of Fforde's seems to be a cause for celebration and a source of pleasure for many people, and for good reason." "Charlie's journey . . . is so absorbing, and Fforde's wit so sharp, the reveal that the narrative is also a commentary on capitalism comes across as a brilliant twist. . . . Whip-smart, tremendous fun, and an utter delight from start to finish." "Jasper Fforde is in fine form in his 14th novel, stringing along this adventure with wry wit." "In this richly detailed, dystopic novel from Fforde (the Thursday Next series), most of the population of Wales hibernates in huge Dormitoria through the unbearable Winter. . . . The sprightly characters, such as the murderous Villains maintaining the habits of English sophisticates, and the intimately feuding pair of Chief Consul Toccata and Aurora, the head of HiberTech security, bring absurdity into the ambiance, but behave understandably enough to be credible. Charlie's confused but determined mundanity is a relatable anchor in this wild winter world, leavened by Fforde's surrealistic humor. Douglas Adams fans will enjoy the vibe." "A wonderfully weird dystopian thriller. . . . As precisely built as an ice sculpture, Fforde's wintry nightmare glistens with mystery and menace. Though the zombie apocalypse elements spin a darker tale . . . plenty of pure Ffordian humor pops up." "Readers familiar with Fforde's gleefully pun-heavy world building will relish this standalone novel, confident that everything will work out in the end for the underdog. Give it to fans of John Scalzi and Genevieve Cogman's Invisible Library series." "Veiled commentary on corporate greed, sleep and dreaming, and twisted popular culture highlight why Fforde, perhaps best known for his "Thursday Next" series, is on par with authors such as Terry Pratchett and Douglas Adams." 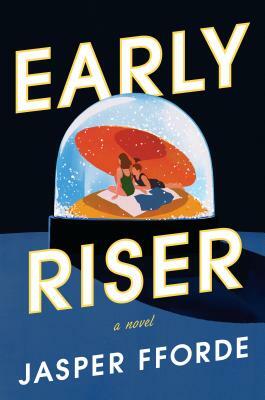 "Fans of Jasper Fforde's unique blend of comic dystopia and quirky British cosiness will not be disappointed with his first novel in six years, Early Riser. . . . Hilarious."